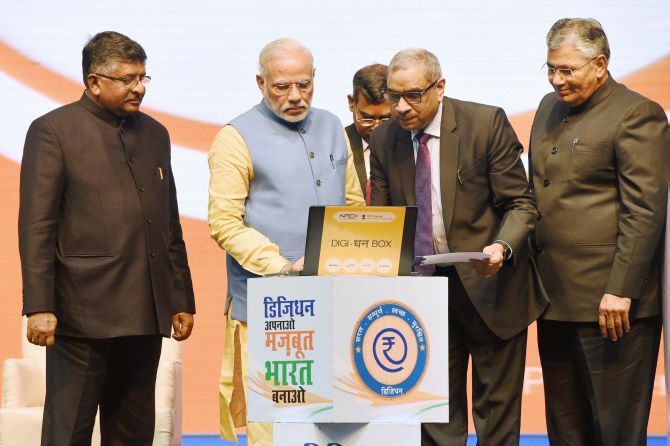 Why is the government unwilling to disclose the winners of its DigiDhan Yojana, asks Syed Firdaus Ashraf. 2017 began on a good note for me. Like many of my countrymen I too decided to go digital. 80 per cent of my payments are now done through digital money. I felt I had arrived in life. Digital transactions are transparent. Only clean people use digital money and I felt proud to join the bandwagon. 'Go cashless!' was Prime Minister Narendra Modi's mantra and I was following it. A friend told me I had been too negative about Modi's vision of a cashless India. "You breathe negativity about the Modi government," he had remarked. That stung, so I decided that in 2017 there would be no more negativity about Modi. I would think positively about him and his decisions. Looking for positivity around me I 'discovered' an instance of it from Modi's Digital India campaign. In a bid to boost digital payments, the Modi government has started awarding Rs 1 lakh every week under the Lucky Grahak Yojana and DigiDhan Vyapar Yojana to Indians who use digital platforms for transactions. This money is being paid by the National Payments Corporation of India, an arm of the Reserve Bank of India. Till date, 614 winners (500 merchants and 114 customers) have been announced. These individuals won Rs 50,000 each. Another 6,500 people won Rs 10,000 in weekly draws. Some also won Rs 1 lakh. Over and above that, some 15,000 people get Rs 1,000 into their accounts every day for electronic transactions. I also found out that on April 14, 2017, the Modi government would award Rs 1 crore, Rs 50 lakh and Rs 25 lakh to three surprise winners. In total, the government would distribute Rs 60 crore (Rs 600 million) as rewards for members of the public who use digital platforms to fulfill Modi's 'cashless India' dream. This project is headed by S K Gupta, chief project officer, National Payments Corporation of India. I wanted to meet the winners and do a story on them -- a perfectly natural urge for a reporter. I called Mr Gupta and sought an appointment. He was very jubilant that someone wanted to do a feature on this project and how Digital India is transforming the lives of ordinary people. He was a gentleman and I felt happy that he was willing to share information about the winners to whom the money was distributed. I told him it would be better if he could give me the contact details of a few winners from Mumbai so that I could meet them personally and highlight their stories. Gupta immediately called over his corporate communication team, and that's when things began to go awry. The CorpCom team interrogated me as if I was a terrorist trying to blow up the Digital India programme! I had gone to the National Payments Corporation of India requesting names of Digital India prize winners for my feature. The scheme Web site (external link) did not have any information about the winners and there was no way I could contact them. And that was why I was sitting in the National Payments Corporation of India office. After 10 minutes of discussion, I realised that the National Payments Corporation of India's corporate communication team was unwilling to share details about the winners immediately. They promised that I would get the information in a day or two. 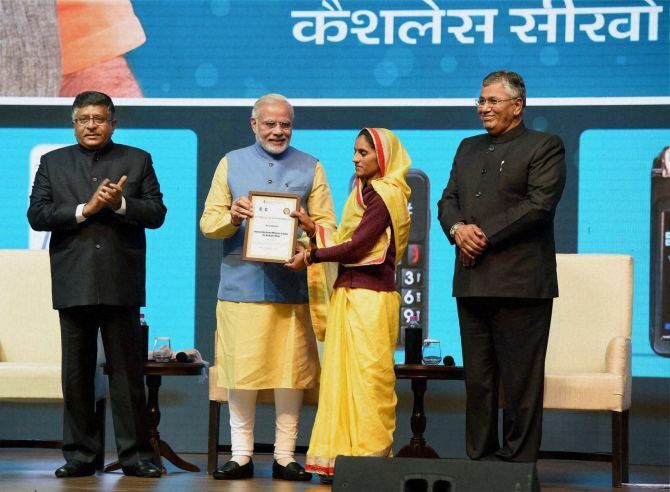 IMAGE: Modi felicitates the first set of 7,229 winners of DigiDhan. However, there is no information available about the winners. We are in the process of identifying winners of the Niti Aayog lucky draw contest with whom you can talk for your story. Please send us few tentative questions which you intend to ask them. I promptly replied to the mail and sent the following questions. What was your first reaction when you got to know you had won Rs 1 lakh? Who and when did the NCPI contact you about the prize? What did you buy using digital money that got you the prize? Did you use digital money prior to November 8 or started going digital only post November 8? Why you feel India needs to go cashless? What are the advantages? Are your neighbours aware of your prize money? If yes, did you educate them to adopt digital mode of payments? After sending the mail, I hoped I would soon get to meet these winners and write a feature about Digital india. I waited for days before realising that I would not get any response from the NPCI. A week later, I sent off a reminder mail. Any luck with the phone number of winners? And guess what! I got an immediate response from the NPCI. Due to compliance issues we will not be able to share the phone numbers with you. Compliance issues? What compliance issues can possible come in the way of disclosing the names and contact details of the prize winners! Why is the government not sharing the information such as this? Surely, the government is not running a scam? Why is it unwilling to announce the winners of Digital India? What do I need to do to get such basic information? Whatever happened to transparency, minimum government etc? I decided to tell my friend that I really, really, tried not to breathe negativity about the Modi government, but what can I do if the government itself wants me to? Want to join PM Modi's digital India team?